Is that not just the cutest loaf of bread you've ever set eyes on? I know, right? 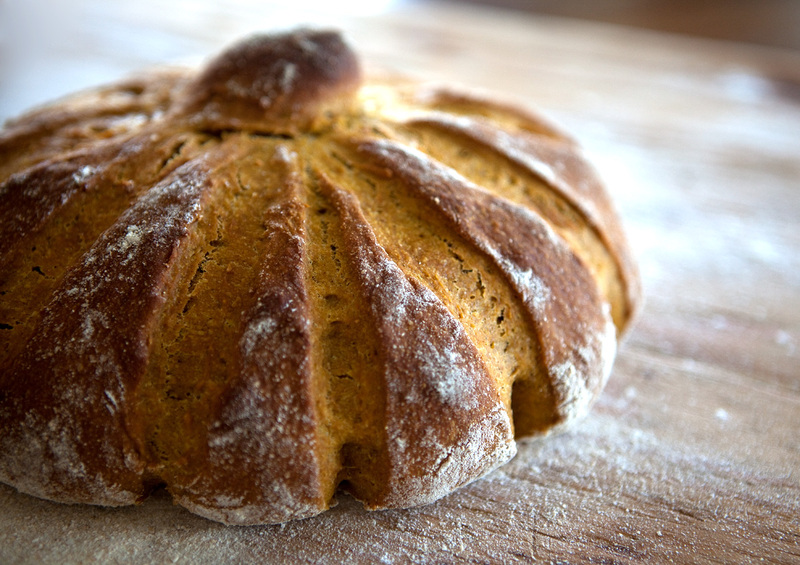 Not only is this loaf shaped like a pumpkin, but it tastes like one, too. Lest I commit an unpardonable sin and forget to mention... It makes for just about the best darn French Toast I've ever pulled off the griddle. And I believe that my dear mother would wholeheartedly agree with me. Yes, we love us some pumpkin spice French Toast slathered in butter and topped with plenty of pure maple syrup. Especially on cool mornings like this one, bundled in our fleece pj's, reading the morning paper together. This, my friends, is what Autumn is all about. 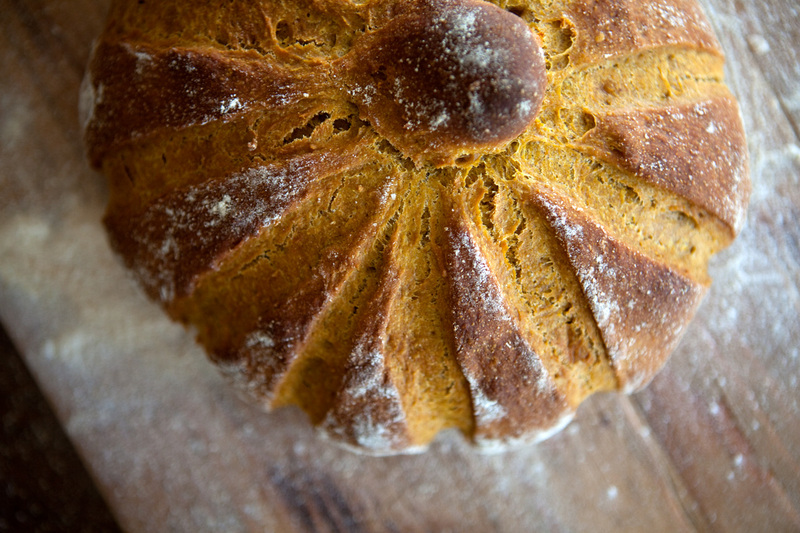 Notes: The original recipe calls for exclusively bread flour, but I found it worked wonderfully with a bit of hard whole-wheat, too, and gave it just a nudge more of the heartiness that I love. Use what you have on hand. I suspect that even all-purpose flour would do alright in place of the bread flour, though the dough will not have as strong of a rise or quite as structured of a crumb. Baking this dough in two loaf pans with a few slashes cut on the top of each would work just fine - for convenience's sake on those busy days. Holy cow, that is beautiful! Sooo cute! Hey Brooke, this bread looks like so much fun to make and eat. Can you cook both breads at the same time in the oven? Thanks! Jana - You could certainly cook both loaves at the same time, just as long as your baking stone is big enough to fit them together. I've seen a lot of breads this fall, but this one is truly gorgeous, and I am so excited to try it. It would be the perfect partner to so many hearty cold weather soups, thanks for posting it! Gorgeous loaf! This bread looks incredible. 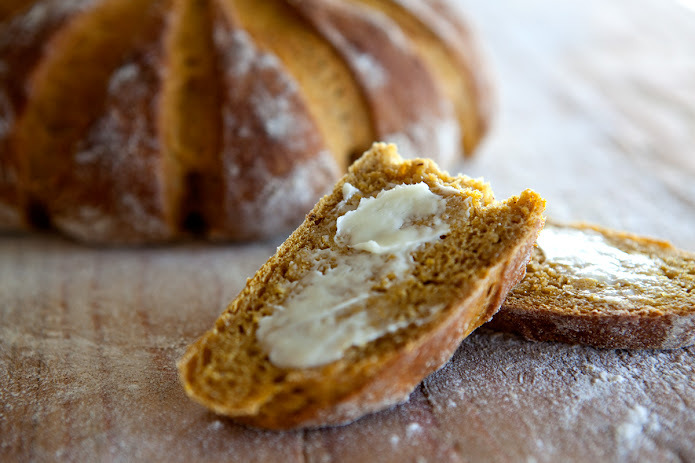 I can't believe I haven't thought of trying pumpkin yeast bread! 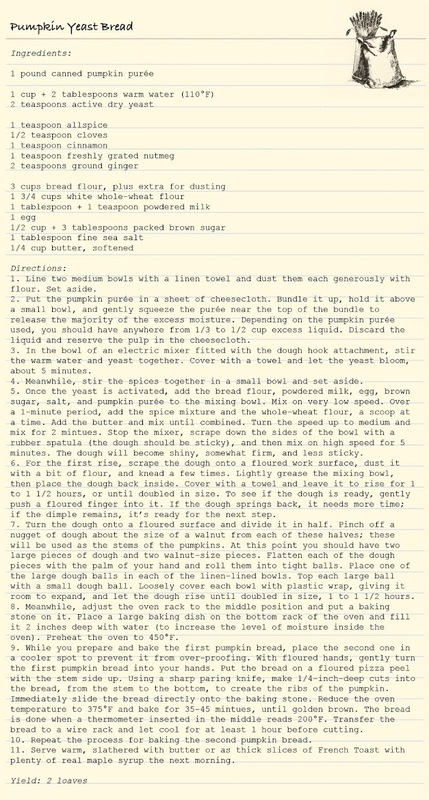 Ohhh, I actually have this cookbook and have somehow, inexplicably, missed this recipe. It sounds brilliant! Beautiful blog, btw! You got me! I am trying out this bread today. I was looking for a bread to bake and this is it. Gorgeous! Hi! Wondering if I can post your image to facebook for National Pumpkin day today?! Sure! You are welcome to. Thank you!